Music by Hildegard of Bingen (1098 to 1179) sung by Emma Kirkby and Gothic Voices, The Unthank Sisters and The Larks. St Bridget of Sweden had a mystic vision of The Nativity. 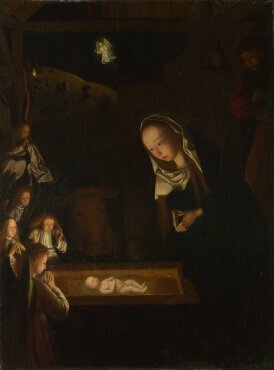 Today’s painting by the Flemish artist Geertgen tot Sint Jans makes that ineffable vision a reality before our eyes and in our hearts through virtuoso deployment of light and shadow. Our heart stilling music today was composed by one of the most extraordinary figures of the Middle Ages (indeed of all Ages!). Hildegard of Bingen was a Benedictine Abbess whose haunting compositions refelect her mystical experiences and her philosophical beliefs. I vividly recall the first time I heard this music in Tower Records at Piccadilly Circus in London. As the gorgeous vocal lines enchanted me I knew, at once, that this record would be a life time companion. And so it has proved. The majestic soprano Emma Kirkby wonderfully complemented by The Gothic Voices under the direction of Christopher Page takes us into mystical terrain where every hair is numbered like every grain of sand. Terrain where Hildegard’s vision of herself as a feather on the breath of God makes perfect sense. We are all feathers on the breath of God. Now we return to our Sleigh which has been travelling for 6 days rushing towards its destination on Christmas Eve. So, for today’s post we will apply the breaks to give ourselves and our willing reindeers a much needed rest. Sometimes the preparations for Christmas can overwhelm us as we worry about all we have to do in such a short time. We can be in danger of falling into the trap of speeding through the season without stopping to savour its true joys and meaning. Perhaps we should remember that at the heart of this event is a birth. A birth much awaited and anticipated by the contemporary family at the centre of the story and by the wider human family of time past, time present and time future. At this birth time and eternity merged to create a new beginning of hope and promise for all of mankind. Mothers have to learn to be still and patient as they wait (especially for their first birth) for the great day, the great moment, to arrive when they will no longer be a mother-to-be but a mother. There comes a miraculous moment, a moment, when after all the waiting and worry that the baby, her child! who has been knit together in the safety of their womb emerges into the world as a unique new creation. This is a moment for stillness and awe and for gratitude. The next recording featured today is achingly filled with stillness and awe. The Unthank Sisters from God haunted Northumberland perform Christina Rosetti’s, ‘In The Bleak ‘Midwinter’ with startling calm and grace allowing the song to breathe and bloom into something truly marvelous. I imagine we all hold our breath throughout this performance as we are caught in the spell of the poet’s striking images and the heart piercing intensity of the siblings vocals. Now, a recording by one of my favourite 50s vocal groups The Larks. The sound here is hushed, seemingly suspended in time. Listening to, ‘All I Want For Christmas Is You’ I feel as if I were a snowflake caressed by gentle drafts and surrounded by millions of other snowflakes falling slowly, slowly, slowly to the earth below. It would be perverse today to showcase any other poem but Christina Rosetti’s masterpiece, ‘In The Bleak Midwinter’. This entry was posted in 1950s, Christmas, Classical Music, Doo-Wop, Folk Music, Music and tagged A Feather on the breath of God, All I Want For Christmas, Christina Rossetti, Emma Kirkby, Geertgen tot Sint Jans, Hildegard of Bingen, In The Bleak Midwinter, The Larks, The Nativity at Night, The Unthanks by Thom Hickey. Bookmark the permalink. “In the Bleak Midwinter” is one of my favorites, and HIldegarde? OMG, Hildegarde! Thanks again. Yes, some extraordinary talents here. Hildegard’s work is oceanic in scope. Regards Thom.